"Naughty Monkey Kicks At Tree"
Remi fights her impending death in "Naughty Monkey Kicks At Tree" and hopes for a cure, but her emotional breakdown reveals the real cure will be Kurt Weller. Rich Dotcom truly is an inspired addition to the cast, so I don't mind the Blindspot writers jumping through ridiculous hoops to connect him to the case of the week. Rich and Patterson get a hit off one of Jane's tattoos — the scythe. There is a serial killer/assassin of the same name and he's escaped FBI capture for years. The CIA always believed The Scythe worked for the Russians, and Rich accurately points out the scythe would be a nod to the USSR. Jane's scythe tattoo has a cluster of dots, which matches the facial recognition scan of Luther Dolov, who has just entered the country. Remi and Weller capture Luther Dolov after he murders a doctor working for an alternate energy research lab. However, Luther is not working for the Russians this time. He rambles on about the people of New York being parasites to the environment, and Rich recognizes a passage Luther references. Several years ago, Rich created a website where people would pay him to offset their carbon footprint. They paid a fee and Rich would use the money to plant trees or help clean the ocean. ... Of course, he didn't; he just pocketed their money. Why didn't these people just plant a tree themselves? They almost deserve to have their money taken if they are this stupid. Rich grew bored pretending to be a world leading environmentalist, so he created, "an algorithm that scourers the Internet for anything remotely ecological, whips it up, and spits it out as propaganda." Rich moved on long ago, but someone used the site to inspire environmental terrorist attacks. Patterson digs into everyone who once bought into Rich's website and finds Daniel Katzovich. He began ELM or Eco Liberation Movement, which has carried out several terrorist attacks all in the name of protecting the environment. Unfortunately, the FBI hasn't been able to connect Daniel to these attacks. Dr. Miller was a member of ELM, but she wanted out. She was stockpiling white phosphorus, which starts fires that can't be put out. It's so awful it's banned in war. ELM took Dr. Miller's phosphorus stash and then had her murdered so she couldn't talk. Rich goes undercover with Weller to figure out ELM's next target. Rich Dotcom undercover is always hilarious, but most of the time he blows the op with his ridiculousness. This time Rich is fairly effective, in no small part because of Patterson telling him to rein it in constantly. They discover ELM is planning an air strike with drones filled with white phosphorus. There's a shoot-out, and Keaton takes a bullet for Remi, but the team is able to stop the attack. Reade and Zapata are reunited, but unfortunately it's not the reunion I was hoping for. Tasha and her torture-loving partner are angling for Reade's password, which he refuses to give. Naturally. Soooo... are we doing this? Tasha is going to stand by while Reade is tortured? Not to say this is a deal-breaker: Kurt "allowed" Jane to be tortured and they worked through it. All right, technically Weller didn't know about the torture exactly, but come on. She was at a CIA black site! Weller never asked, but he knew what was going on. Reade and Tasha square off. She's begging him for the password, and he is trying to figure out what the heck happened to the love of his life. Tasha's basic reasoning is that she worked for the NYPD, the FBI, and the CIA and was burned by every agency. They are all corrupt, so she's looking out for number one now and doing things her way. Ehhhh... it's not the full story, but it has a very "my soul be damned" ring to it which is what she's going for. Tasha is trying very hard to convince Reade she's evil now. Reade asks her, "Did you ever love me?" Tasha replies: "Yeah. I've always loved you." SOB. Let's just ignore when Tasha pretends like she's just saying what Reade wants to hear and he's nothing more than a mark to her. Dude, she's trying to make sure you keep your eyeballs. The lady with the meat fork is craaaaazy. Crazy Meat Fork Lady decides torture isn't the way to break Reade's will — Tasha is. She puts a gun to her head and threatens to kill Tasha if Reade doesn't give up the password. Zapata is legitimately freaking out because this nutcase will actually do it. Thankfully, we only get to the count of two before Reade coughs up the password. At least Reade isn't a total dummy. He tells Tasha: "You worked with Blake because she was easy to control, but Madeleine is a different story." DING DING DING! Zapata has been in over her head for a while, but "Naughty Monkey Kicks At Tree" is when she finally gets the upper hand. Tasha gives Madelaine whatever information she wanted from the FBI and then she kills Claudia (a.k.a. Crazy Meat Fork Lady). Claudia has been threatening Tasha from minute one, but I was still completely shocked when she killed her. Maybe it's the way she killed her. Tasha opened the trunk and it was covered in plastic. She doesn't hesitate putting three bullets in Claudia, and then casually tosses her in the trunk. STONE COLD. Zapata lies to Madeleine and tells her Claudia was MI-6. Madeline has been looking for a mole, but she thought it was Zapata. Is she? I still can't quite figure out what Tasha's endgame is in all of this. She's not working for the CIA, that's for sure. So I don't know who Tasha would be a mole for. Remi finds out Kurt had Allie look into her contact, so she knows he's not buying the happy wife routine completely. Therefore, in a stunning move of diabolical subterfuge, Remi cuts her hair. DON'T BELIEVE IT, KURT. ALL THE SECRETS ARE IN THE HAIR! Sometimes I feel like Martin Gero reads my tweets and then makes storytelling choices based off of them. I was onto the hair, so of course he cuts it. Kidding. Kind of. Patterson finds a potential treatment for "Jane," but she has to be tested to find out if she's a viable match. This isn't a simple blood test. Remi has to undergo a spinal tap with no anesthesia. SERIOUSLY? Yeesh. We do get some amazing Kurt "Husband of the Year" Weller scenes out of it. He kisses "Jane's" hand, and constantly reassures her everything will be all right even though he's not sure it will be. Someone copy this man's DNA and replicate him already. Despite all her training and desire to watch government agencies burn, Remi is scared. She puts on a brave face with the no anesthesia thing, but she is genuinely concerned she's going to die. When the test comes back and she's not a match, it begins to dawn on Remi — she might actually die. What's fascinating about this scene is it's not Kurt comforting Jane. It's not Kurt comforting Remi pretending to be Jane. It's Kurt comforting Remi. For the first time, we see Remi drop her guard. All the anger and hatred seems to fade away. She's not obsessed with getting her mother released. The mission no longer matters. Remi is just scared. She doesn't want to die. She allows herself to take comfort in Kurt. He holds Remi and instead of the Machiavellian glare we typically see over Kurt's shoulder, we see her fear instead. Remi buries her head into Kurt's shoulder and allows herself to be loved. It's really a stunning moment and I think a critical turning point. Remi keeps coming up with reasons why Kurt Weller needs to remain alive. However, it's becoming clear Kurt is having an impact on her. She's fighting it with everything she has, but Kurt is making inroads even though it's completely unbeknownst to him. 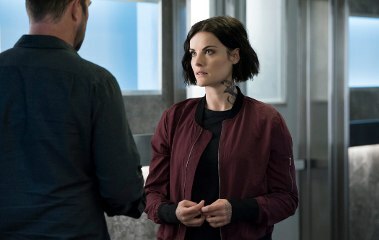 This is an important question for Blindspot to answer: Would Kurt and Jane even be together if she had not lost her memories? The short answer is no. The zip brought them together, and the zip is bringing them together once again. It's clear Remi is developing feelings for Kurt, but they aren't connected to her memories as Jane. This is Remi's heart and soul being impacted. She may shut the door as soon as it opens, but the point is the door is opening. Remi isn't able to admit it, but she is beginning to fall for Kurt. Is it love? Is it more powerful than her desire to see the world burn? No, not yet, but we're getting there. Ultimately, whoever she is — memories or no memories, Jane or Remi — she will always find her way to Kurt Weller. We also have confirmation Remi is beginning to remember Jane's memories. She insists Keaton bring her to Shepherd as her dying wish. Remi tells Keaton he owes her because not long ago she was the one being tortured by him at a black site. The way Remi references the torture makes it abundantly clear she remembers it. If Remi is beginning to reclaim Jane's memories and developing feelings for Kurt then it's game, set, and match. Shepherd doesn't stand a chance. Remi is determined to free Shepherd, who is the most important emotional connection to her besides Roman. Shepherd is a master manipulator and unfortunately Remi has no clue how evil her mother truly is (or how evil their plans are together). I fully expect Remi to free Shepherd next week and the only combatant against that woman is Kurt Weller. He will be the only person who can emotional influence on Remi on the same level. A fact that will surprise not only Shepherd, but Remi as well. "And the right to apologize for turning a perfectly good online scam into a terrorist organization." I love how Rich is just as righteously indignant over his scam being co-opted as he is about the threat to millions of lives. Kurt needs to tell Patterson what's going on. Patterson knows all. Patterson fixes all. Keaton took a bullet for Jane, so I'd say they are square now. Keaton is in a medically-induced coma, which is going to make getting to Mama Shepherd trickier.